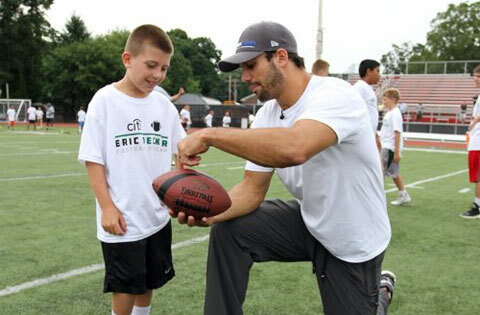 Throughout the camp Eric Decker will offer tips and instruction, highlighting the finer points of football. Participants will experience various stations specializing in fundamental football skills and will participate in touch football games. Participants will be placed in small groups according to age to ensure that each child gets maximum instruction. Eric Decker instructing one of the participants at the ProCamp in Boonville, N.J. Oct. 2014. 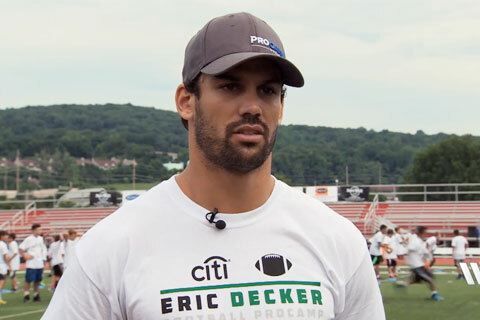 Eric Decker is a former wide receiver for the Denver Broncos. He had a breakout season in 2012 where he had 85 catches for 1,064 yards and 13 touchdowns. On March 13, 2014, Decker signed a 5 year $36.25 million contract with the New York Jets. Playing Field Promotions is a booking agent for motivational sports speakers and celebrities. If you would like to book Eric Decker for a speaking engagement or personal appearance, contact Eric Decker’s booking agent for appearance & speaker fees at 1.800.966.1380.